This Month’s Book: Goodnight Already! 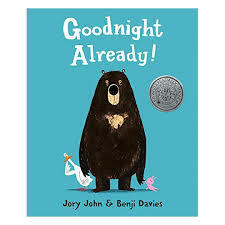 Our Cover to Cover Book of the Month for July is Goodnight Already! by Jory John & Benji Davies. Bear is so tired he could sleep for months…but how will he ever fall asleep with his restless duck neighbor bothering him? Read this silly story and find out! Bear and Duck are in complete opposite states! Bear being VERY tired and Duck being VERY awake. The book Goodnight Already! by Jory Jon & Benji Davies provides a wonderful opportunity to observe these complete opposite states and have a conversation with your child about ways to respectfully navigate situations like this. While reading, talk to your child about how Duck is responding to the situation. Is Duck allowing Bear to get the rest he so desperately wants? How is Bear responding? Is there anything different they both could do to allow both their needs to be met? Books are such a wonderful tool for introducing new vocabulary words! While reading, point out words that may be unfamiliar and then talk about what they mean. “Duck used his spare key to get in. What does spare mean?” It can be difficult to describe a word’s meaning so make it a shared learning experience and look up the word together! Send a picture of you and your child playing Simon Says together. Be creative! We can’t wait to see what you loved about Goodnight Already!